Do volunteers give better blood? The Memorial Blood Center sets up a table in the University of Minnesota Duluth’s busy bus hub. Every few minutes a student comes by to set up an appointment, and then heads out to the blood drive bus. In one day, dozens of students volunteer to get stuck in the arm with a needle for nothing but a T-shirt. The scene isn’t unusual to a modern-day American audience. Not so long ago, though, it would have seemed extraordinary. It was only a few decades ago that the U.S. stopped paying blood donors and started using volunteers. Research in recent years, beginning with Richard Titmuss’ 1970 book “The Gift Relationship,” has shown that a voluntary system is more effective than a paid one in collecting blood. Titmuss found this by contrasting the U.K., which adopted a voluntary system earlier, with the old U.S. payment system. He found that the U.K. collected more—and higher-quality—blood. Yochai Benkler, co-director of Harvard’s Berkman Center for Internet and Society, says this research is groundbreaking because it contradicts the economic theory that self-interest drives all. “Blood donations were really the first time that we saw a massively important public system produced in a model that was based not on payment but on social motivations,” Benkler says. Now imagine that the city decides to pay $50 to everyone who helps clean up the park. “Suddenly you scratch your head,” says Benkler. You begin to examine your own motivations. Are you really a good person, or are you just doing it for the $50? Of perhaps equal importance, will your neighbors think you’re just doing it for the $50? Benkler says at this point, you will likely give up and find another activity that is “unambiguously good.” Something that will satisfy the need to signal to yourself, and to your neighbors, that you are a good person. You are the kind of person who cleans up a park. The United States now bans payment for blood donation, and the World Health Organization’s guidelines call for voluntary blood donation. But some new research questions the conclusions of Titmuss’ and others’ research showing you get more and better blood from volunteers. The studies were authored by Nicola Lacetera at the Univerity of Toronto, Mario Macis at Johns Hopkins, and Robert Slonim at the University of Sydney. 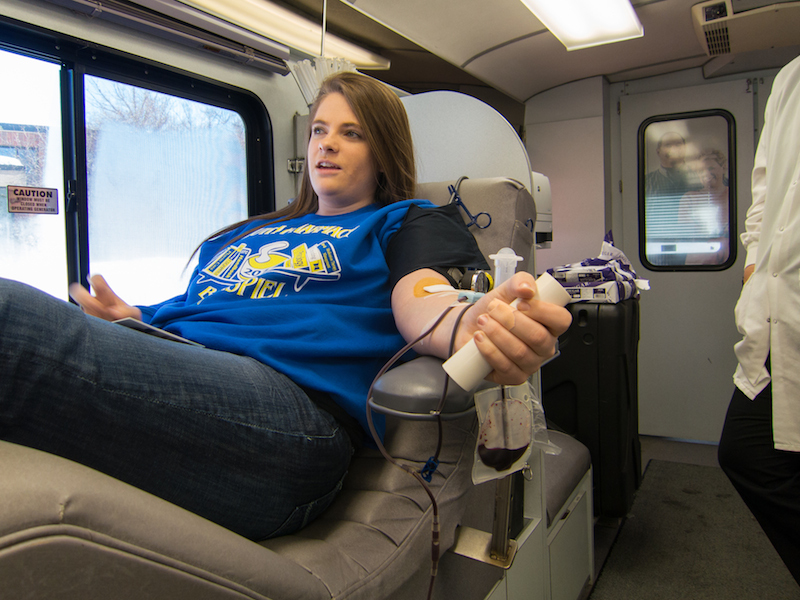 They show that offering incentives such as T-shirts and gift cards leads more people to donate blood. In a 2013 paper in Science, the authors argue that previous research relied on surveys, and people may have told researchers that they were more generous than they really are. A forthcoming paper in Management Science details results of a study in which some people were offered gift cards worth $5, $10, or $15. The higher the amount, the more likely people were to donate. Of course, receiving a gift card is not quite the same as receiving cash, but the researchers weren’t able to study cash incentives, since they are illegal. They suggest that, in light of their work, it might be time to revisit that policy. Donors at the recent drive in Duluth got T-shirts for their efforts, but volunteer Abby Guderian says she didn’t know she was going to get anything when she signed up. She and a friend board the bus in high spirits. They are here to get stuck in the arm with a needle, voluntarily. They plan to wear their T-shirts tomorrow, to a class where they sit together. Is that why they’re giving blood? So that tomorrow, they can send a clean signal that they were good people yesterday?